Get big results from little learners. 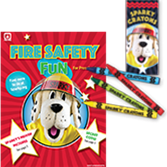 Fire Safety Fun for Preschoolers' and Crayons Value Pack mixes simple tips with engaging activities. The sooner you teach fire protection and prevention behaviors, the better...and NFPA®'s Fire Safety Fun for Preschoolers Coloring/Activity Book and Crayons Value Pack engages kids with 8 pages of age-appropriate activities designed for non-readers. Notes to parents reinforce important concepts and offer a way get the whole family involved in making every day safer from fire.